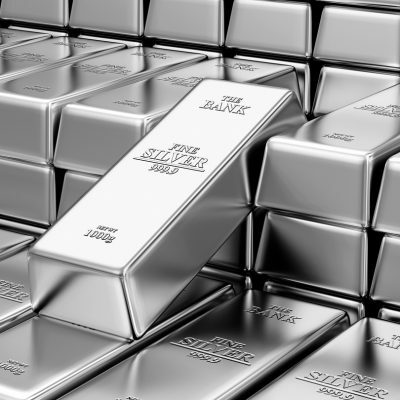 Unallocated silver is the main source of silver investment in the world, making up more than 95% of the market. While unallocated accounts are not suitable for those interested in collecting precious metals, they are the most secure and convenient way for investors, requiring little to no maintenance or risk. Allocated silver is, quite simply, physical silver that you can personally own. An account for allocated silver can be opened when a client asks for a specific metal, in this case silver, to be stored separately in either bar or coin form, along with a detailed account of the characteristics of the metal (for example, weights and assays). The client is in full ownership of these assets, and has the ability to either store them at home or via a third party, such as in a safe deposit box or in a vault. When storing precious metals via a third party, there are usually additional storage fees involved that the client must cover. For example, when buying physical gold and silver through Gold Investments, we offer either delivery to your home so you can secure it yourself, or offer for it to be stored securely in the London Silver Vaults at a price of £4 per ounce per annum. Unallocated silver is quite different from allocated silver, and this is an important difference to be aware of before investing. Unallocated silver differs in that the metal, in this case silver, is not separated from other account-owned metal, but rather is pooled. Each person owning a part of the pooled silver shares this with all other owners. Unallocated silver can be easily bought through a bank, and upon purchase, they will issue you a certificate confirming your purchase. Your share of silver will be stored at a mint or other central location on your behalf. Unallocated metal, such as gold and silver, is the cheapest, most common method of owning metal, and can also be very convenient. The units of unallocated silver accounts are most often based on one ounce of silver, which in turn is based on a .999 LGD (London Good Delivery) fine silver bar. If you are interested in purchasing allocated silver, you can buy silver coins and silver bars online with Gold Investments. We only offer the finest quality metals and only list items that are in stock online. We accept payment in the form of cheques, bank transfers, debit cards, and cash. Please note that we do not accept credit cards, and that are only accept cash payments up to £7,500 per person. It is possible to have your silver delivered worldwide, and is free for purchases over £1,000. It is also possible to pick up your purchase directly from our London offices. To set up an appointment to visit us at our London offices, please call 0207 283 7752 or email info@goldinvestments.co.uk. Our offices are open weekdays from 9:00 am to 4:30 pm, with online trading available 24 hours a day.